While we are experiencing some of the warmest weather ever recorded this winter, plants have a way of surviving these spells. I have heard about lilacs budding and other such phenomenon, but these plants will all survive. As for your daffodils, it is useless to try to do anything to protect them from the eventual cold weather that will set in. These are just the leaves that are appearing now. As long as the flowers buds don't appear, the daffodil will return to its slumber once the cold weather hits. If it doesn't, then the daffies will bloom a little earlier this year. 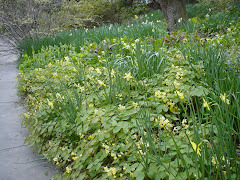 But don't worry, follow all of your usual daffodil care and they will return again next year.